BENGALURU: Many of us have been fascinated with the story of Titanic; the unsinkable ship that tragically lost on its maiden voyage, over a century ago on April 15, 1912. Before the tragedy, before the chaos, there was a dinner – popularly referred to as the ‘Last Dinner’ on the Titanic. It is said that only two menus were recovered from the Titanic for the night of April 14, 1912. One of these menus was served in the first-class dining saloon of the RMS Titanic, several hours before the tragedy struck. With the 100th anniversary of the catastrophe in 2012, Titanic enthusiasts around the world signed up for dinners, which recreated the extravagant last meal on the ill-fated vessel. A 10-course meal served to the first-class passengers included Brill Fillets, Corned Beef, Dumplings, Grilled Mutton, Salmon, Norwegian Anchovies, Veal and Ham Pie, Bologna Sausage, Galatine of Chicken and varieties of cheese and wines from across the world. If you want to get a feel of this unique dining experience, you do not have to travel anywhere else. 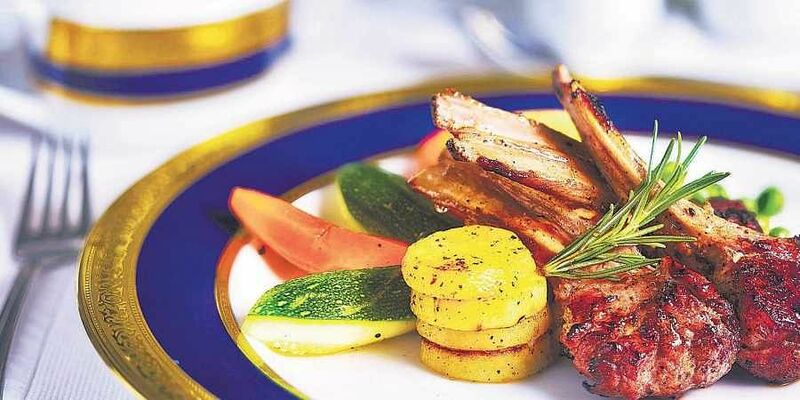 Raj Pavilion at the iconic ITC Windsor, Bengaluru, is serving abridged versions of the menu from the Titanic dinner in a three-course plated format for lunch, and the buffet dinner will include items from the menu as well. Getting a taste of the three-course meal served by Chef Akshraj and team, here’s an account of the experience. 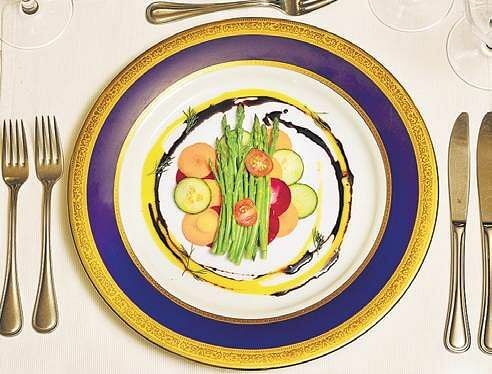 The meal at ITC Windsor began with Asparagus Salad, Poached Salmon, Mousseline Sauce as the non vegetarian option, and Cucumber and Champagne Saffron Vinaigrette, as the vegetarian option. As the second course was served on the table, it calls for one to stop all that you’re doing and give all attention that it demanded. Calling Sauvignon Blanc, eye pleasing, is an understatement. As the knife cuts through the mutton chops, the colour of the meat show how well it has been cooked. Chef Jodha and his team have done a good job of presenting the vegetables in an old classic way. Punch Romaine, made with wine, rum and champagne was served next, and proved to be the perfect palate cleanser. To bring the meal to a finish, Peaches in Chartreus Jelly, was served to us. The dessert is an absolute classic, which was served with a hint of modernised way. As you scoop the dessert, the hidden peaches in chartreus jelly is almost like finding a treasure. The hint of char, beautifully cooked peaches and balanced sweetness defines this intricate dessert.